This delicious dish, which includes fresh tomatoes – known in Provence as pommes d'amour, or love apples – is found almost anywhere in Provence, but especially in the Vaucluse. This is a pan-cooked chicken dish and almost certainly is a dish that originally would have been prepared outdoors over a wood-burning fire. The better the quality of the chicken, the tastier the dish will be. 1 fresh bouquet garni of oregano, marjoram, bay leaf and basil. 7. 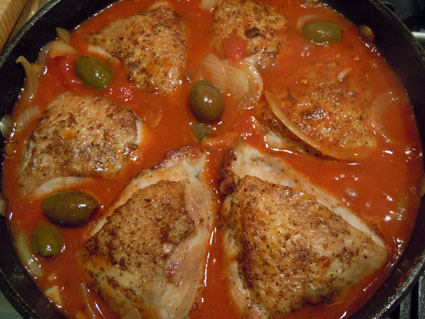 Add the tomatoes, tomato purée and olives, and cook for 3-5 minutes on a high heat, stirring. 8. Return the chicken to the pan, cover with a lid (or foil) and cook for 8-10 minutes, until tender. 9. Mix the garlic and parsley together, and scatter over the chicken and serve hot. The garlic and parsley mix, in this simple form, is known as persillade. If it is introduced into the cooking at a late stage, as suggested here (#9), the garlic is quite strong. This can be mellowed somewhat by combining this step with #8.